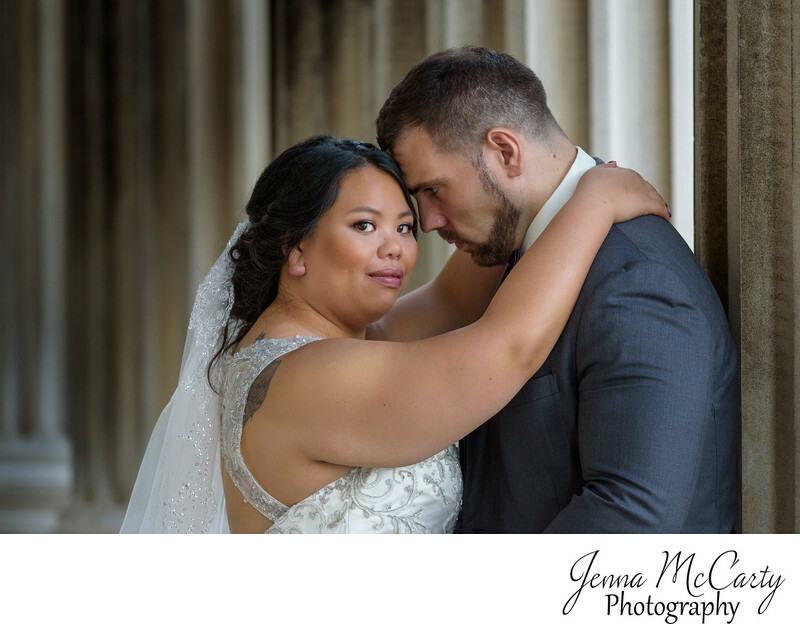 Angela and Jim met on a blind, internet date in August, 2015. They have been together ever since. Their first date started out with a plan to go to a Pirates game and then at the last minute they decided to go to Delucas beforehand for brunch. On our way back to his place in Washington, PA, they stopped at Primanti Bros for dinner before falling asleep on his couch with their faces mashed together. Their wedding date was July 14th, 2017. The day started out at the couple's house in Struthers, Ohio with Angela getting ready. Jim started his day out by getting shaved at Elixir Beauty Salon in Struthers, Ohio. After that, the groomsmen took their photos outside of Stambaugh Auditorium in Youngstown, Ohio. Before the ceremony, the couple decided to do a first look in the grand staircase of Stambaugh Auditorium. The ceremony took place in the grand ballroom of Stambaugh Auditorium. After the ceremony, the couple did a grand exit out of the main staircase in the front of Stambaugh Auditorium. After the grand exit, we did bridal party photos inside Stambaugh Auditorium and outside on the main stairs of Stambaugh Auditorium. After the bride and groom portraits, we headed off to their reception venue, which was Avion on the Water in Canfield, Ohio, where they elected to take their family portraits. It was a magical night filled with lots of laughter and dancing. This photo features the bride and groom in front of the famous pillars of Stambaugh Auditorium in Youngstown, Ohio.